I am something of a crazy woman this weekend (which is decidedly different from a maenad) so I will try to get a post done later this week. But for now, let me rely on that old staple of columnists, the re-run. This one is about how Jesus and the Beloved of Isis, Osiris, have some things in common. This is not one of those ‘Christianity is really just Paganism’ posts nor is it a Pagan rant about how the Christians appropriated our God. They didn’t have to. And they were really trying not to. Yet much of early Christian history takes place in…well…Egypt, so it would be very natural for newly minted Egyptian Christians to employ elements of their prior religion in the way they thought about their new one. You’ll find that post here. 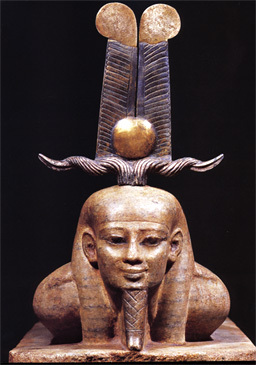 Before Osiris could rise, He had to roll over on His stomach as you see in this beautiful statue. I am so pleased that I got to see this statue in person as part of a traveling exhibition. Here’s a close up of His serene and beautiful face. Magificent statue of the God Osiris! 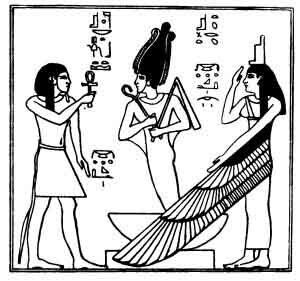 Osiris rises again, May his country rise up against those who would destroy any Temple or holy site of the Ancient Egyptian Gods & Goddesses. Thanks Isidora. I enjoyed reading the piece about Easter & the parallels between Christ & Osiris. Different branches with common roots. I might just have to revisit Dion Fortune’s MQ again. Blessings, Russ.